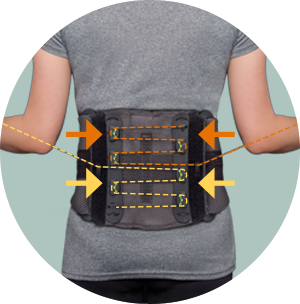 The revolutionary Peak Scoliosis Bracing System™ is an unloader brace designed to improve posture which can enhance the quality of life for adult scoliosis patients. 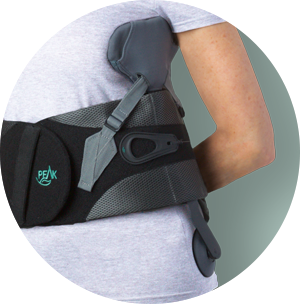 This patented, highly adjustable brace from Aspen helps promote a natural center of gravity and enhanced mobility. Improving torso alignment can lead to increased vital capacity and ultimately lead to an increase in a patient's ability to perform activities of daily living. 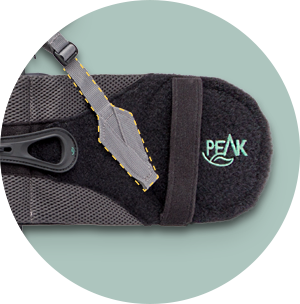 The Peak Scoliosis Bracing System is available in either a one-size adjustable or sized version. Acts as an unloader brace for the spine. Force is applied to the patient by the thoracic and trochanter pads on one side and by the belt on the other side. The applied forces work together to promote a better relationship and reduce body lean. Aspen's SlickTrack™ Tightening System features an independent upper and lower tightening mechanism, providing direct compression where needed to support fatigued muscles that spasm and cause pain. To optimize the angle from which tension is applied, the posterior tension strap can be placed anywhere along the attachment strips based on patient needs. 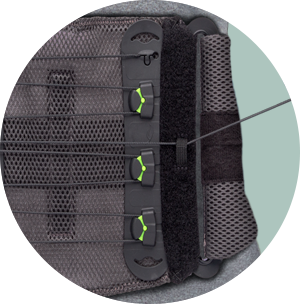 Can be adjusted or modified to accommodate patient's unique needs, then placed anywhere on the belt to optimize support. Reduces friction making it easy to control the level of compression regardless of patient's strength. Yes, the brace can be worn under clothing, but an undershirt is recommended next to the skin for enhanced comfort.